A $1,000 prize was awarded to Greta Alfaro for her work In Praise of the Beast, 2009. This work is presented as a collaboration beteween Winkleman Gallery and Spain Culture New York. In addition to the cash prize, Greta Alfaro will also receive ongoing exhibition opportunities via The James New York’s collection and rotational video art series hosted at the hotel’s Urban Garden. Moving Image and The James New York have an ongoing partnership dedicated to fostering artistic talent and supporting emerging artists. Greta Alfaro (Spain, 1977) lives and works in London. She graduated in a MA in Photography at the Royal College of Art in 2011 and holds a Fine Art degree by the Universidad Politécnica de Valencia. Greta Alfaro’s solo shows include A Very Crafty and Tricky Contrivance, commissioned by the Genesis Foundation at the Fish and Coal Building in London 2012, Invención, curated by Andrea Paasch, Museo Ex Teresa Arte Actual in Mexico City 2012, Elogio de la Bestia, Museo Huarte de Arte Contemporáneo in Pamplona, Spain 2010, In Ictu Oculi, curated by Antonia Gaeta, Carpe Diem Art & Research in Lisbon 2009, and Ricorrenza, curated by Alba Braza Böils, Dryphoto arte contemporanea in Prato, Italy 2008. She has taken part in group shows such as Whitechapel Open at the Whitechapel Gallery in London, Bêtes off at La Conciergerie in Paris, Drama, Baby, Drama at Kunsthaus Essen, Germany, Inanimate Beings. Inéditos at La Casa Encendida in Madrid and Bloomberg New Contemporaries 2010 at the ICA London. Her video work has also been part of the International Film Festival Rotterdam, the International Documentary Film Festival Punto de Vista in Pamplona, Spain and the Rencontres Internationales at the Centre Pompidou in Paris. Greta Alfaro works mainly in video, installation and photography. About Spain Culture New York – Consulate General of Spain Spain Culture New York is the Cultural Office of the Consulate General of Spain in New York City and belongs to Spain Arts & Culture: the network of organizations supporting Spain’s culture and language in the US. This network promotes culture and art, and strives to strengthen bilateral cultural, artistic and academic exchanges. This cultural network also presents many arts programs – featuring dance, music, visual arts, literature, humanities, architecture, and design – in a variety of venues, also in collaboration with relevant American entities throughout the country. Nitehawk announce that they have selected three artists from this year’s Moving Image Contemporary Video Art Fair to screen before the first three months of our inaugural Art Seen program are: Tommy Turner, represented by P.P.O.W Gallery, New York, Eva and Franco Mattes, represented by Postmasters Gallery, New York, and Tellervo Kalleinen & Oliver Kochta-Kalleinen, represented by AV Arkki Gallery, Helsinki, Finland. Moving Image is very pleased to announce several new programs and collaborations taking place at the 2013 edition of the fair. Moving Image and The James New York are proud to announce an ongoing partnership dedicated to fostering artistic talent and supporting emerging artists. At this year’s Moving Image Art Fair, a $1,000 prize will be awarded to a presenting artist that demonstrates exceptional vision and artistic talent. In addition to the cash prize, the selected artist will also receive ongoing exhibition opportunities via The James New York’s collection and rotational video art series hosted at the hotel’s Urban Garden. 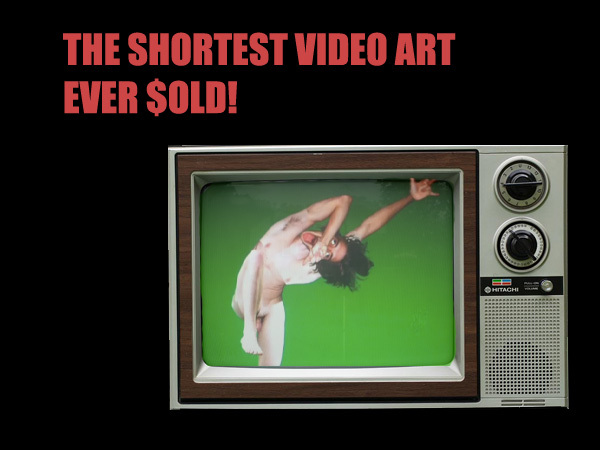 The Shortest Video Art Ever Sold is a site-specific physical curatorial project, offering an exclusive “screening” of new art by top net artists in the newest social media format, Vine – a video all of six seconds long. SVAES is presented in a purposely analog/DIY format, a Fair Shopping Network “television program” that will grant the fair goers opportunity to immediately purchase the Vine Edition of 1 and, for an extra fee, have the artist tweet the new artistic acquisition at the patron, so they can have their collecting acknowledged publicly. ! SVAES subverts the insular art market, the Vine brand, the “like economy” of the social media and video art as property/commodity. Marina Galperina is the Art Editor of ANIMALNewYork, and a Brooklyn-based freelance journalist, specializing in Russian internet phenomena, conceptual vandalism and net art. Kyle Chayka is senior editor at renowned art blog Hyperallergic.com and a freelance culture and technology writer based in Brooklyn. He is a participant of and spectator on various events and exhibitions in New York and elsewhere. Moving Image and Nitehawk Cinema are happy to announce their partnership for the Moving Image Contemporary Video Art Fair New York in which three videos from the 2013 fair will be selected to screen in the cinema this spring. Fostering the relationship between artist moving images and the cinematic space, Nitehawk programmer Caryn Coleman will choose the three video works from this year’s Moving Image to be screened in the cinema this upcoming April, May, and June. One video will be shown each month on the theater’s big screen before Nitehawk’s new signature series Art Seen that launches in April. Art Seen a monthly art-focused program showing artist documentaries, the art world in film, and artist directed features that also includes guest-curated artist moving image program pre-show. The April debut is a 35mm presentaton of Orson Welle’s F for Fake (1973).